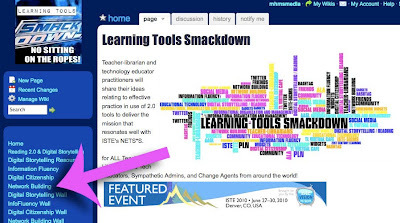 ISTE10 SIGMS Forum: Learning Tools Smackdown! No sitting on the ropes! Bring your most effective learning tools to the ring. Categories: digital storytelling, reading promotion, information fluency, and digital citizenship. Join Joyce Valenza, Gwyneth Jones, and other speakers for this event. For a full line-up and ALL the Resources & Goodies visit our Wiki! Want to watch the video in a larger size? Visit ISTE Vision!